14k white gold. 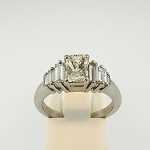 Set in four prongs is a round brilliant diamond weighing .95 ct. Clarity VS2. Color M. Size 6 1/2. Total approximate gold weight 2.0 dwt.